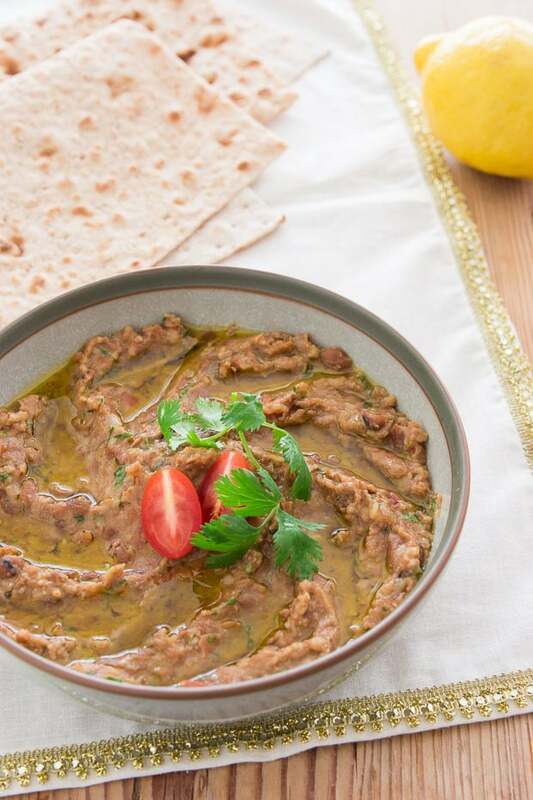 Ful Medames are an easy delicious Mediterranean dip made with fava beans, tomatoes, onions, garlic olive oil and lemon juice. Perhaps its my Asian DNA, but I’ve always been more of a savory breakfast person than sweet. Whether it’s a bowl of Pho, or an Eggs Benedict I’ll almost always chose the savory path when dining out. The trouble is, savory breakfasts tend to take more time to make than a slice of toast or bowl of cereal. That’s why I often end up going sweet, or skipping breakfast when I’m in a rush to get out the door. This is when Ful Medames swoops in and saves the day. It’s originally an Egyptian dish, that’s worked its way onto breakfast tables around the Middle East. 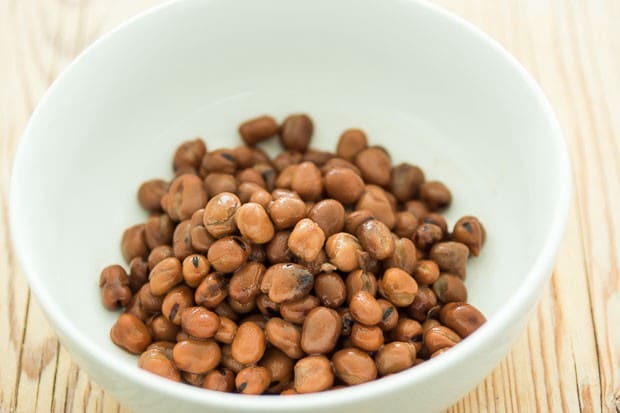 Somewhere between a bean salad and a bean dip, it’s usually made by seasoning cooked fava beans with olive oil, spices and aromatics before being served with bread and pickled vegetables. This makes it a quick, satisfying breakfast if you keep your pantry stocked with a few cans of beans. 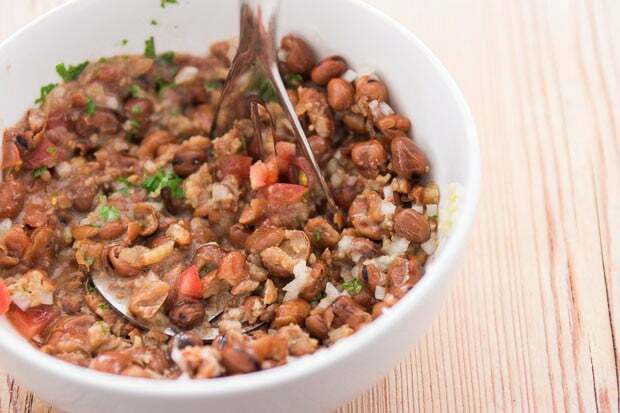 The details of how Ful Medames are made and what goes into it them is a hot-button issue because every home makes them differently. Some people mash the beans, others leave them whole, some cooks (especially in the Levant) top Ful with Tahina, while others top it with boiled eggs. Even the transliteration of the Arabic name فول مدمس‎, runs the gamut from ful madammas to foule mudammes. My point is that there’s no right or wrong way to make it. Personally I like chopping up some sweet umami-rich tomatoes, crisp onions, and pungent garlic and mashing them together with the fava beans, lemon juice, olive oil, and a bit of cumin. The ratios are up to you, but I’ve included my recipe below. Heat the beans in their liquid either in the microwave or on the stove. Drain the beans and put them in a bowl, reserving the liquid to add later. Add the tomatoes, onion, garlic, parsley, lemon juice, olive oil, cumin and salt to the bowl with the beans. Mash the beans together with everything else until they are the consistency you want. The mixture will probably be quite thick, so add some of the cooking liquid from the beans until it reaches the consistency you want. 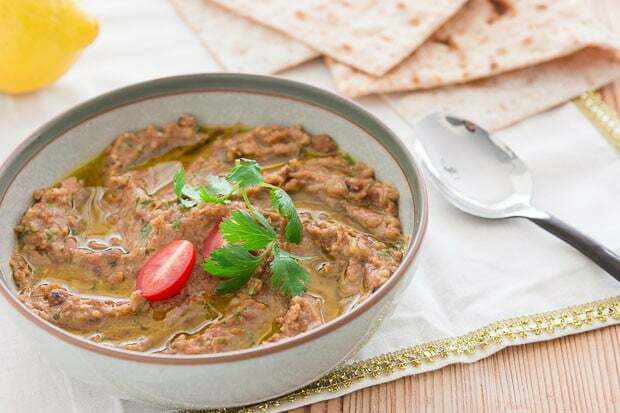 Adjust the seasonings to taste and then plate ful medames in a bowl, using a spoon to make some waves on the surface. Cover with more olive oil and serve with bread and pickled vegetables. Thank you for this recipe. I am a savory breakfast person too, with the disadvantage that I don’t like eggs. I usually eat toast and hummus with a big pile of sprouts on top. This recipe will add some variety to my delicious bean breakfast. Another savory breakfast person…thank you for a new option! My childhood in a photo! My parents are originally from Iraq and we sometimes had this for breakfast on weekends. I just can’t imagine eating it cold! We warmed it up on the stovetop with all of the canning liquid, mashed it very lightly (just enough to thicken the liquid with beany starches but kept most of the beans relatively whole), and threw in chopped garlic and lemon juice, topped with a healthy dose of chopped parsley, and a solid drizzle of olive oil. Pretty much what you have here, so try it warm! It’s delicious! Hi Jackie, nice catch, the first step got cut off when I cut and pasted it from Word. Sorry about that! Being Lebanese, Foul and Loubieh BZeyt are some of our staple food, I grew up eating them. and Marc in No recipes site is the only Chef that made these recipes as authentic as my childhood recipes. Thank you so much.